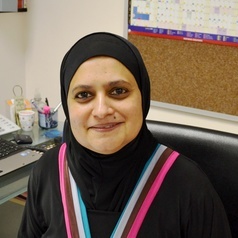 Professor Sabiha Essack (B. Pharm., M. Pharm., PhD), Professor in Pharmaceutical Sciences at the University of KwaZulu-Natal (UKZN) is the South African Research Chair in Antibiotic Resistance and One Health and a Wellcome Trust Research Fellow who completed research towards her PhD in Pharmaceutical Microbiology at St Bartholomew’s and the Royal London School of Medicine and Dentistry in the United Kingdom. She received several prestigious scholarships and bursaries from the Wellcome Trust, the Medical Research Council (MRC), the National Research Foundation (NRF) and the University of Durban-Westville during the course of her Masters and PhD studies. Her research has been published in several journals and has been presented at a number of national and international conferences. Professor Essack began her professional career with the B. Pharm degree in 1988 and practiced as a hospital pharmacist for three years in the KwaZulu-Natal Department of Health before returning to the University of Durban-Westville in 1992 to pursue the M. Pharm and PhD degrees. She is a C-rated researcher by the NRF, has established the Antimicrobial Research Unit at UKZN and has secured several research grants for Essential National Health Research, from the World Health Organization (WHO), the Norwegian Agency for Development Cooperation (NORAD), MRC and the NRF investigating strategies for the prevention and containment of antibiotic resistance. Professor Essack is expert consultant on antimicrobial resistance to the WHO Africa Office, founder and co-chair of the South African Chapter of the Alliance for the Prudent Use of Antibiotics (APUA), country representative on the Global Respiratory Infections Partnership (GRIP), serves on the South African Chapter of the Global Antibiotic Resistance Partnership (GARP), the South African Antibiotic Stewardship Programme, WHO’s Technical Working Group on Health Workforce Education Assessment Tools, and is co-founder of the South African Committee of Health Sciences Deans. She is a Ministerial appointee on the Board of the Office of Health Standards Compliance, an elected member of the Academy of Sciences of South Africa (ASSAf), a peer-reviewed member of the Southern Africa FAIMER Regional Institute (SAFRI) community, member of the Bio-economy Heath Innovation Sector Coordination Committee of the Department of Science and Technology. She previously served as Ministerial appointee on the National Health Research Ethics Council, as well as on the national Department of Health, on the National Executive of the Pharmaceutical Society of South Africa, the Professional Body Reference Group of the South African Qualifications Authority (SAQA) and the Programme Accreditation Panel and Standards Development Reference Group of the Council for Higher Education (CHE). Professor Essack is Associate Editor of the South African Journal of Epidemiology and Infection, serves on the Editorial Board of the African Journal of Microbiology Research, frequently reviews papers for several international journals as well as research proposals and rating applications for the FP7 Programme, the MRC and the NRF and is a member of the Society for Clinical Microbiology and the Federation of Infectious Diseases Societies of South Africa. o	Antibiotic pharmacokinetics and pharmacodynamics. •	Molecular epidemiology of antibiotic resistance. •	Phenotypic and genotypic characterization of antibiotic resistance, including but not limited to antibiotic resistance genes, genetic determinants of resistance and clonality. •	Virulence factors and their associated genetic determinants in antibiotic-resistant bacteria. •	Health policy and health systems strengthening to optimize the management of infections in the context of antibiotic resistance and stewardship.